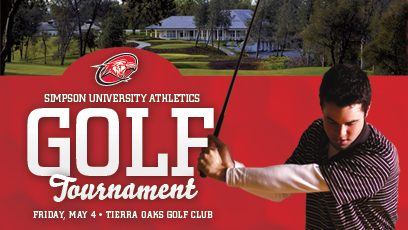 REDDING, Calif. – Simpson University will hold its annual athletic fundraising golf tournament at Tierra Oaks Club on Friday, May 4. Those interested in the golf tournament can register for $100 per person before May 1 by visiting simpsonu.edu/golftournament or calling (530) 226-4703. Registration is limited to the first 100 golfers. All registered golfers will receive breakfast and lunch, and 18 holes of golf, including a cart. Golfers are also invited to attend an awards ceremony. This year’s golf tournament will feature an auction and prize giveaway. This year’s title sponsors are Oxford Suites and Pepsi. For additional information on the golf tournament or to inquire about being a sponsor, contact Robin Bankson at (530) 226-4703 or rbankson@simpsonu.edu.